Azul Skies Smiling at Me | Food E.
New York has endless restaurants and it’s impossible to keep up with all of them. Restaurants open and close before you even get a chance to peep the menu, so while I try to eat at as many new places as I can, sometimes I cave and end up at old favorites. I’ve been to Azul on the Lower East Side of Manhattan multiple times (five that I can distinctly recall) and their $19.95 recession special can not be beat: small green salad, 8 oz. skirt steak (tender, juicy, and “holy hell” delicious), mashed or fried potatoes, and a glass of wine. Seriously. Are you on your way there now? You should be. 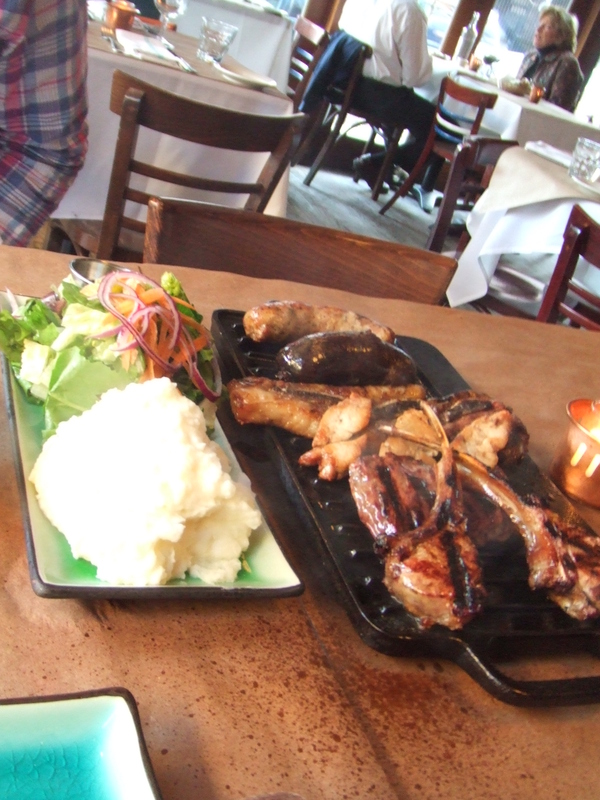 Azul Argentinian Restaurant Located at 152 Stanton Street (corner of Suffolk and Stanton). The bar serves beer and wine, and beware: vegetarians will NOT like this restaurant. 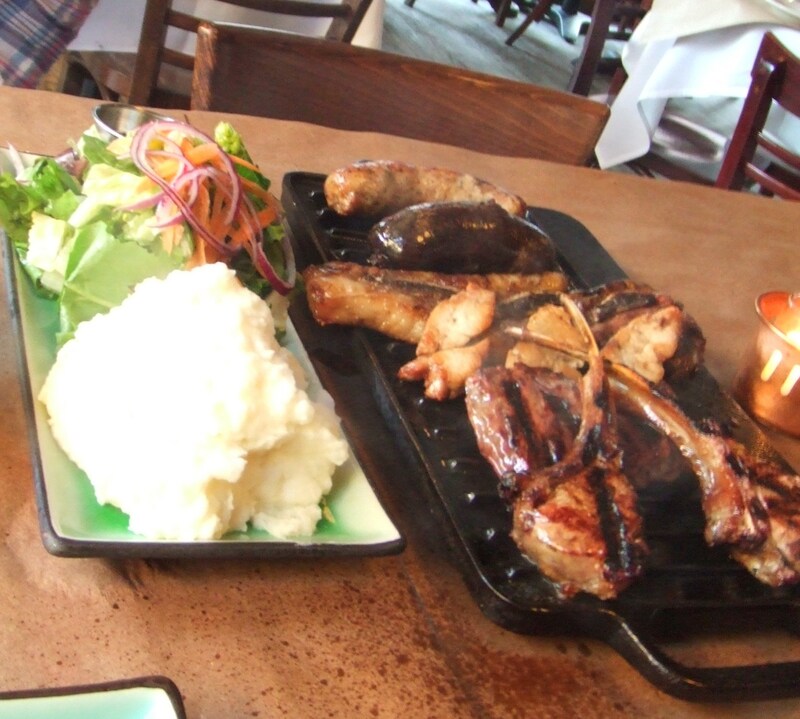 The Argentines like their red meat. My kind of people. I don’t really have to do a Verdict here, do I? I love this restaurant. It was warm out, the doors were open onto the street, pre-smelly-summer breeze was blowing, I had a glass of Malbec in my hand… What was I talking about? I have to admit I’m not a fan of blood sausage, but everything else was just as it should be. The skirt steak was seared on the outside, juicy and tender on the inside. The chorizo was spiced perfectly and the short ribs had the distinct, salty, beautiful flavor I had hoped for. This was my first foray into sweetbreads and I have to tell you: tastes like chicken. 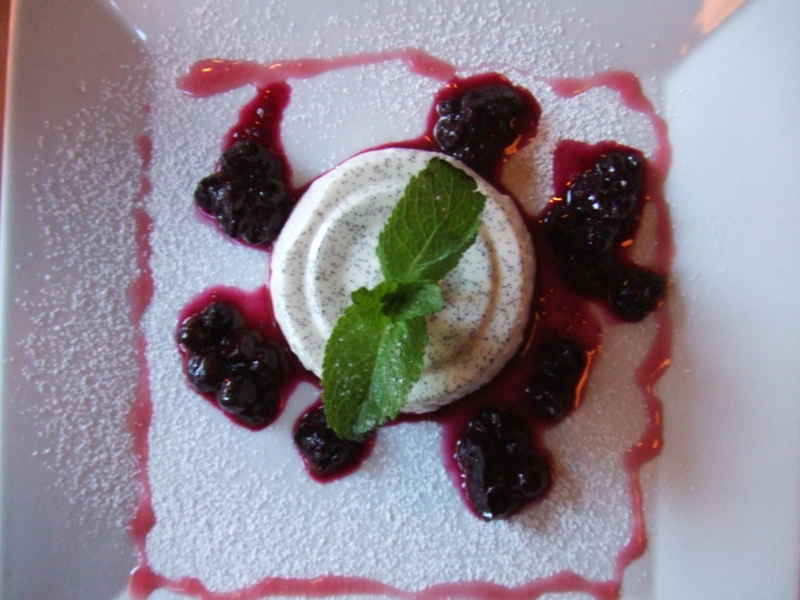 Oh, and the vanilla bean panna cotta with blueberries? Custard is never my first choice for dessert but this was just what I wanted after the heavy mixed grill: smooth, firm consistency with a light vanilla bean flavor that melted in my mouth. Thanks for dinner, Azul! See you in a couple weeks.